Dear Mosaic Family,If you've been following along with us at Mosaic, you know that we're approaching the 4th installment in our 5-part series, called "Why God Why." We've attempted to show that Christianity makes emotional sense, personal sense, and intellectual sense. Faith in Christ sustains both the weight of the heart and the mind. Last week I attempted to make the case for theism. However, even if there is a God, how do we know it's the Christian God? How do we know that Jesus Christ is God? Wasn't he just a man? Even if he was a great man, and a powerful, charismatic leader, wasn't he still a man? 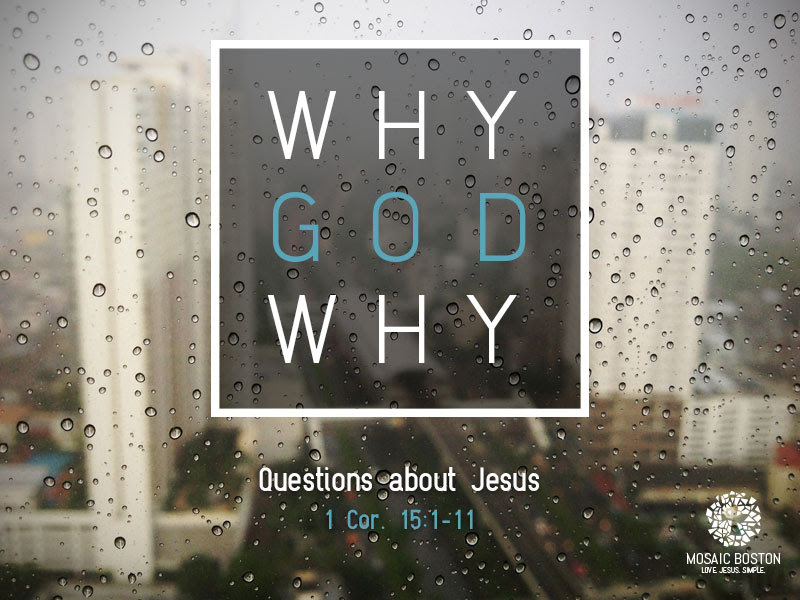 Be sure to join us tomorrow as we wrestle with questions about Jesus. Membership Class: Not a member of Mosaic, yet? No worries! We've got another membership class coming up on Saturday,May 17th, 9am-noon at the ICC. Attending this class is the first step to becoming an official member of Mosaic Church. Member Meeting: Saturday, July 12th, 10am-noon. ICC. If you're a member, plan to attend our quarterly members' meeting. Newer PostQuestions about the Bible.